The Trump administration's nominee to lead NASA wants the agency to study climate change on Mars, even as he questions if it's happening here on Earth. "Mars once had a magnetic field, rivers, lakes and an ocean on its north pole," he wrote. "At some point, Mars changed dramatically and we should strive to understand why. Studying other planets can inform our understanding of Earth." Earlier this year, Bridenstine told E&E News that he's open to moving earth science out of NASA and into another federal agency. The idea of cutting climate change research, or consolidating it into one agency, has been discussed by members of the House Science, Space and Technology Committee. Bridenstine sits on the panel. 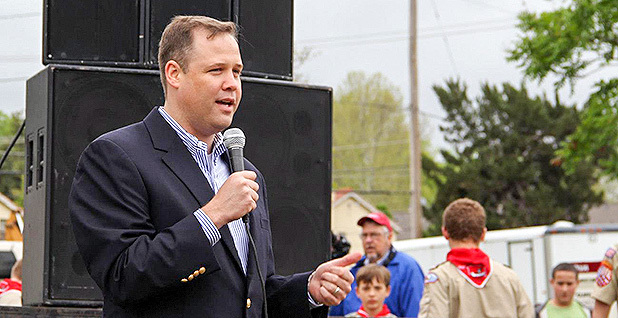 In his written response to senators, Bridenstine said earth science at NASA is often unfairly pitted against planetary science for financial resources. He wrote that the rivalry was "not in the best interest of NASA, the United States or the world." "NASA must continue to advance both Earth science and planetary science for the benefit of mankind," he wrote. "As a United States Representative from Oklahoma, I have led efforts to improve severe weather prediction and I have come to appreciate how complex Earth is as a system," he wrote. "NASA must continue studying our home planet." The notion that Mars is experiencing climate change is a talking point among climate skeptics who say the planet has been changed by solar radiation. If Mars is experiencing climate change, the assertion goes, then warming on Earth can be blamed on the sun. The claim comes from research comparing two images of Mars, one from the 1970s and another from the 1990s. It concludes that darkening of the planet's surface meant Mars is warming. Mars is the closest neighbor to Earth in the solar system, and comparing similarities between the planets is a useful way to understand aspects of our home, said Huiqun Wang, a Mars researcher at the Harvard-Smithsonian Center for Astrophysics. She said Mars was once a warm planet with a thick atmosphere. It's now cold with a thin atmosphere, and scientists are trying to puzzle out that transition. However, while Mars has experienced climate change, its changes occurred on a cosmological time scale. That's far different from the relatively rapid warming being observed on Earth. "There is a difference when people think about climate change on earth and when people think about climate on Mars. If you talk climate change on Earth, people are not thinking on that long time scale," Wang said. "Short-term climate change driven by human activity is different than long-term climate change driven by the solar input and the orbit of the planets, they change over time, as well."